Above: The most popular Michael Jackson vigil in New York City last night was at the Apollo in Harlem, where a spirited tribute was paid to the late “King of Pop”. 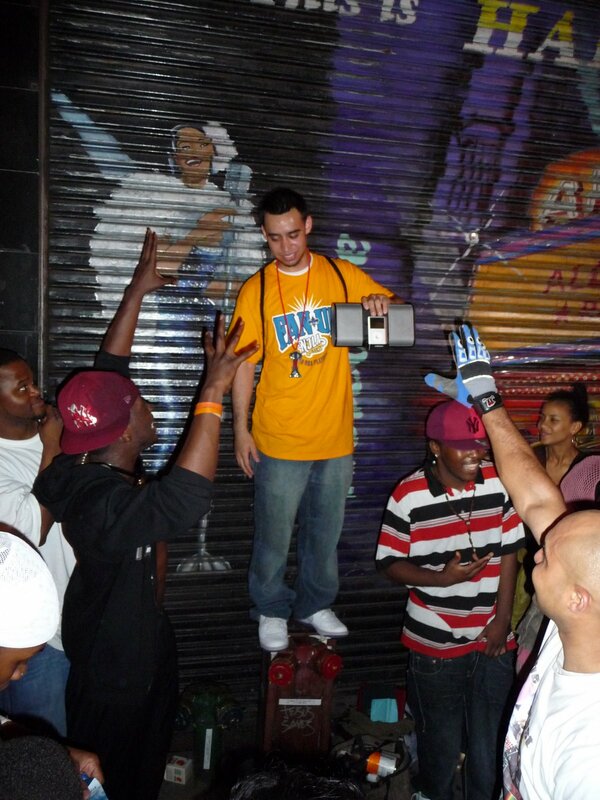 Above: Michael Jackson fans danced to his beats all night long at the Apollo. This photo was taken at around 2:00 a.m. on Friday morning. The Apollo festivities began during the early news of Jackson’s death on Friday afternoon. Above: Coined “DJ Standpipe” by the guy in the hat on the left, this Jackson fan played “what the people want to hear” all night across from Apollo Theater. 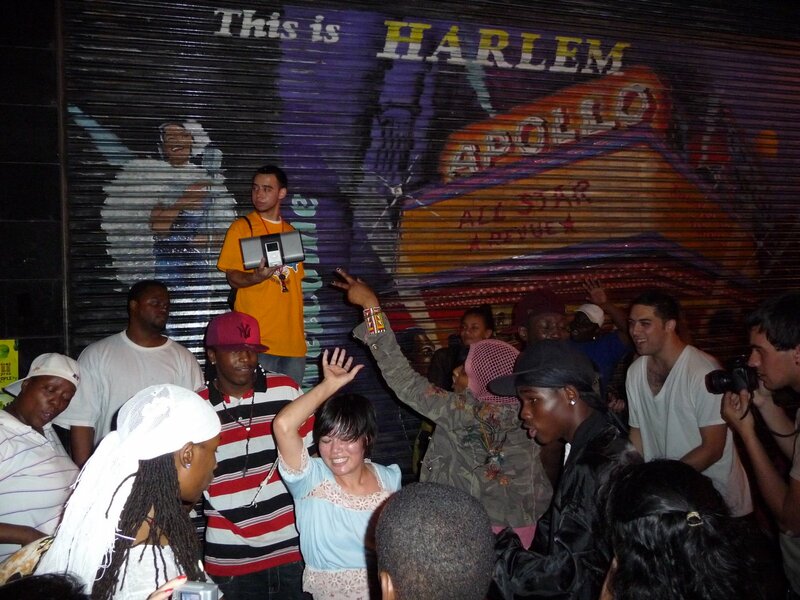 Above: A video of the Apollo Theater Michael Jackson tribute dance party in action. Above: A well-received Michael Jackson impersonator with someone I think looks like LL Cool J. Above: CNN Senior U.N. 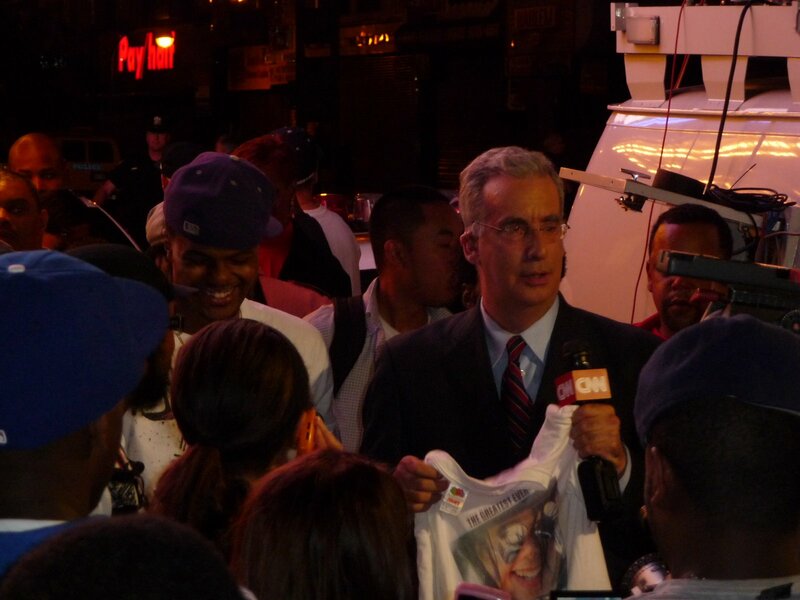 Correspondent Richard Roth (also an NYU grad) reported live from the Apollo in Harlem. 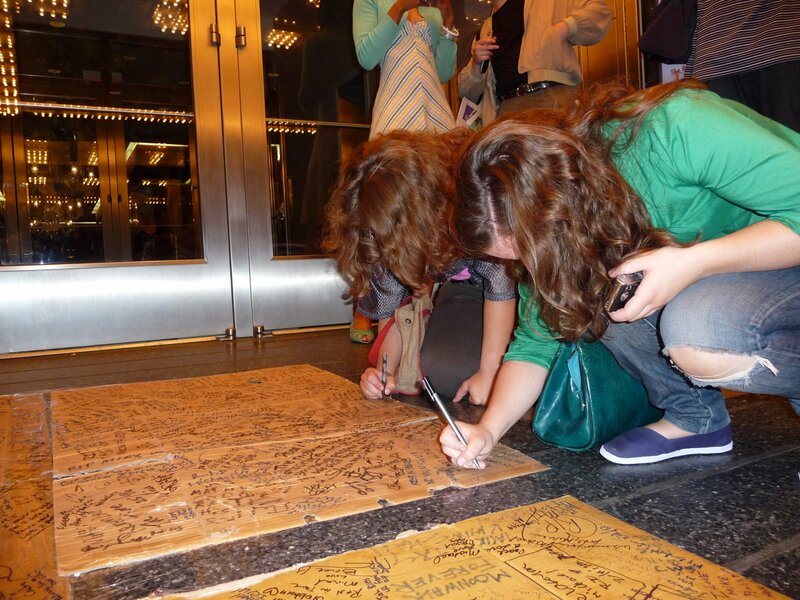 Above: Four cardboard boxes were taped in the entrance of the Apollo, where fans poured their hearts out to Jackson, leaving both notes of peace and love. 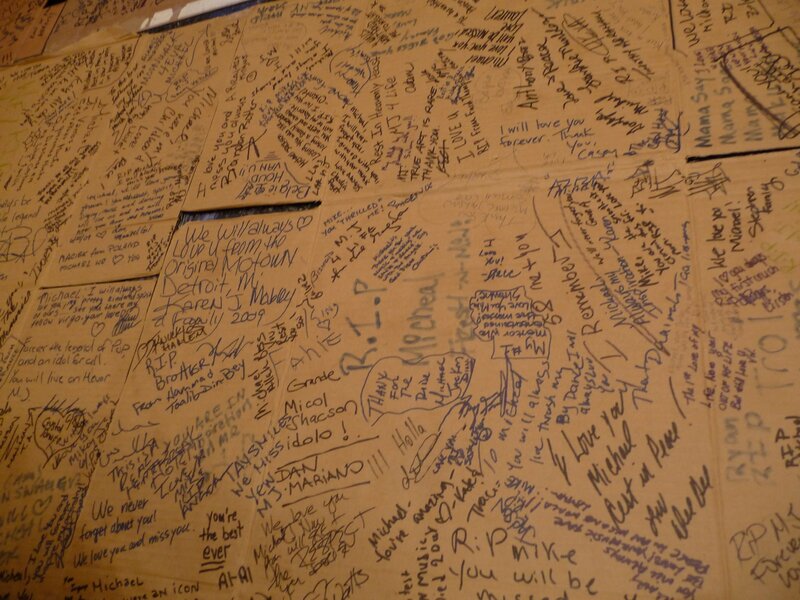 Above: Finding space on the cardboard memoir was difficult for late-comers. 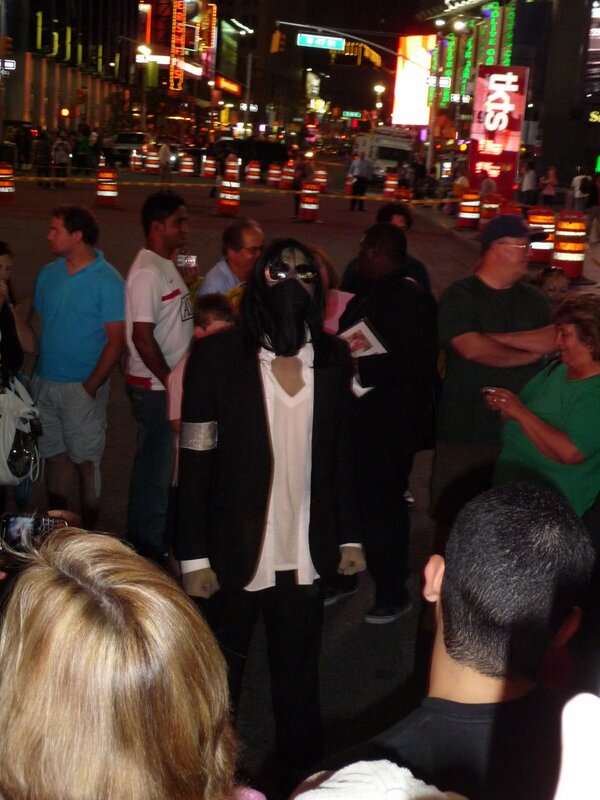 Above: Another Michael Jackson impersonator appeared in Times Square. Less welcomed than the impersonator at the Apollo, this guy stood awkwardly in a sea of camera-happy tourists. A group of angry fans approached him at one point for his tasteless act. I feared that he was on the verge of getting beat up. I stayed at The New York Times building until 11:30pm last night after work, staying updated on the latest news on Michael Jackson’s shocking death. By around 10pm, I had a game plan. I learned of the two vigil sites by then. One took place at Times Square outside the recently-closed Virgin Records Megastore. After hearing about it, I highly publicized that one on Twitter and Facebook, to get the word out. 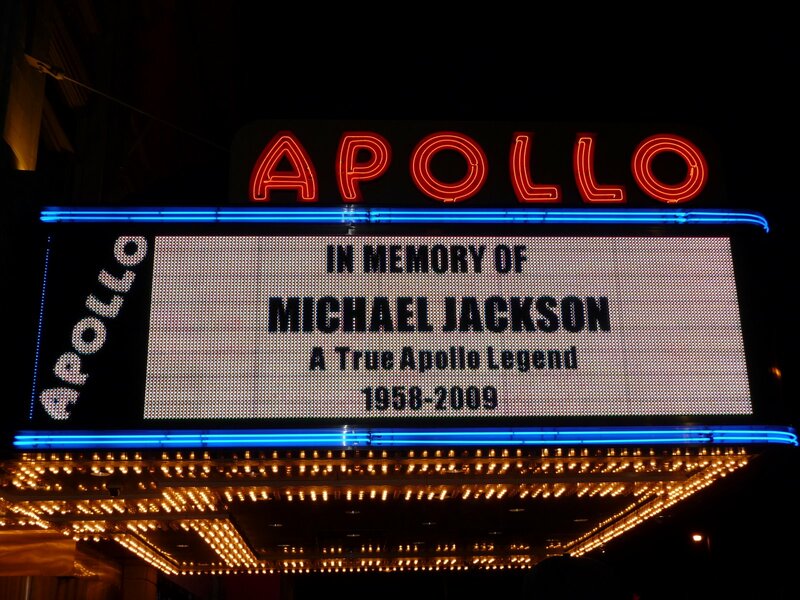 Shortly after, it occurred to me that the Apollo Theater in Harlem HAD to be the most spirited MJ vigil in NYC. Why? The Apollo is where he first performed as a 9-year-old boy with The Jackson 5. It is also where the band won the coveted Apollo Amateur Night award in 1969. Weikai (my boyfriend) and I decided to check it all out. After a brief visit to Times Square, where we saw an awkwardly still Michael Jackson impersonator, we headed to Harlem. Exiting the subway, we heard MJ music blaring from many passing cars. The two-block walk to Apollo was pretty eventless, but upon arriving we heard music from various sources filling the air, saw a much more graceful and tasteful impersonator, spotted a few news crews (including CNN), witnessed fans signing a piece of cardboard in memory of Jackson, and passed by a few tchotchke-sellers. Within about 20 minutes, I even saw my supervisor, Soraya, who directed me a few blocks away from the Apollo where hyped-up fans were chanting “Michael, Michael, Michael…”. A few minutes after arriving to the new site of fans, it was broken up by the NYPD who told the fans to go around the corner (out of the street) to a safer place. By that time, it was nearly 2:30a.m. and Weikai and I were getting sleepy. I left feeling like I had witnessed a part of history — a moment in time that many will remember for years to come. damn, wish I could've made my day more of a tribune to MJ.